As a result of working closely with customers to continue to understand their needs, Draeger has developed the CPS 7900, a gas-tight chemical protection suit. 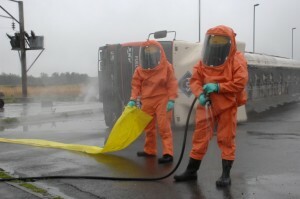 Even when being dragged along the ground or any other abrasive surface in a rescue situation, this reusable suit maintains wearer protection from hazardous substances. Should an outer layer be damaged, the wearer is kept safe by the use of a new tear-proof, five-layer, laminated D-Mex material which protects against chemical effects, bursts of flames and toxic and cryogenic substances. For additional safety the wearer’s arms remain in the suit sleeves at all times, ready to respond through the inclusion of a pressure gauge holder in the field of view. Freedom of movement and full awareness of the environment are vital to ensure a quick reaction. These are assured by the comfortable, ergonomic design and an almost natural field of vision through the anti-fogging visor. The ability to operate in a broad range of environments is essential; the D-Mex material is safe to use in potentially explosive environments and also offers protection from contact with extreme temperatures as low as -80C. Faster recovery in man down situations can be aided by the Draeger-Connect system, allowing the rescuer to grip the suit of the wearer. Hands can also be kept free as this same system can be used to carry tools and equipment into an incident. Offering a lifetime cost reduction because of the 15-year suit life, further buy phentermine florida savings in both time and cost can be achieved by reduced stock variables. For example, correct glove selection and fitting is fast and easy with the quick change patented cuff lock. An integral height adjuster allows pace length to be adjusted to suit the wearer and means that fewer sizes need to be stocked to suit the requirements of a diverse workforce. The selection of different boots for different tasks is also made safe and easy by the inclusion of gas-tight socks. Allowing easy integration with existing equipment, the suit is compatible with other forms of PPE such as helmets and face masks, the suit can also be connected to an external source of air for long duration work. In addition, when working in hot and humid conditions, the wearer can be supplied with cool air to ensure maximum comfort and performance. Meeting European and International standards such as EN 943-2 and the SOLAS convention, the Draeger CPS 7900 answers the requirements for emergency teams from the fire and rescue services as well as industry. Draeger has been developing and producing chemical protection suits for over 50 years and the CPS 7900 is the culmination of this experience in a range which also includes the new lightweight Draeger CPS 5900 for single-exposure applications.